An anti-war protest has taken place in the heart of Donetsk. Unsurprisingly it was not reported on Russia Today or by the Stalinists. There has been increased fighting in parts of Donetsk and Luhansk Oblasts in Eastern Ukraine. This has been most notable in the Ukrainian city of Pisky, a city five kilometers from Donetsk held by Russian forces. The OSCE has criticised the shelling in contravention of the Minsk Agreement which set a demarcation line where heavy weapons were to be withdrawn. This escalation has provoked unrest inside the self-styled ‘Donetsk Peoples Republic’ where there has been very little public protest since early 2014. This was a concern raised on numerous occasions previously including by the independent miners unions as using buildings in this way was increasing civilian casualties when counter-fire was returned. 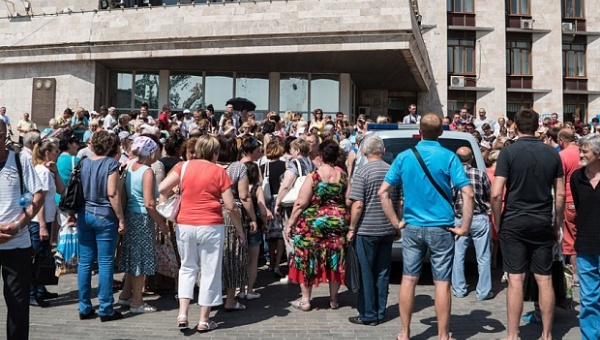 The head of the regime in Donetsk – Zalarchenko came out and met the protesters insisting the fighting would continue. Russian journalist Pavel Kanygin, working for Novaya Gazeta, one of Russia’s independent and opposition media, filmed the demonstration. A day after the anti-war rally, Kanygin was detained and beaten, and deported back to Russia. There has since been an increased military presence next to the government building where the protest took place.